Hi again, a friend asked me to make a couple of thank you cards and left the design up to me, so, of course it has butterflies in it! I sprinkled orange and prussian blue brushos onto some watercolor paper and smooshed it around to create this 2 tone effect. I spritzed it with blue patina perfect pearls too, though it's hard to see the shimmer in the pic. I scored a couple of lines either side of the border die for more definition. 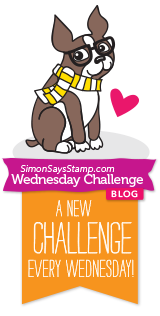 I'm linking up to the things with wings challenge at Simon Says Stamp Wednesday. It's anything goes at Bizzy Becs Store Blog. 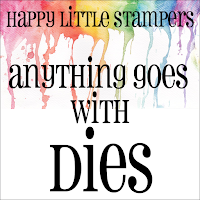 Happy Little Stampers has an anything goes with dies challenge. I've used 2 Memory Box dies and a sentiment sticker. 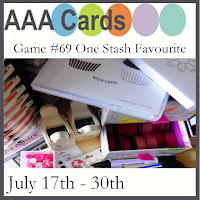 AAA Cards wants us to make a CAS card with one favourite thing from our stash. I love using diecuts! Simon Says Stamp Work it Wednesday - use wafer thin dies or stencils. Dies: Memory Box Fairytale Flower Border and Moonlight Butterfly. Other: brushos; sentiment sticker; bling. I feel cut off from the world when my internet is gone! I'm happy things are working again for you. This card is so pretty and I think your friend will be happy with this card. This is a beautiful butterfly. As gentle as only nature can create :-) Great use of the border, it looks stunning! Still creating wonders with those butterflies! Lovely card, Cathy! Thanks for playing along with us at HLS! Beautiful gentle colours and who doesn't love butterflies! Thanks for playing at AAA Cards. Beautiful colours Cathy, love the butterfly and side border. Gorgeous card, butterflies and blue, two of my favorites. thanks for sharing with us at AAA Cards! Gorgeous, beautiful card Cathy, what a great way to create some colour. Beautiful clean card! Love the colors. Thanks for playing with us at HLS! Georgous card, love the CAS design so very pretty. THanks for joining us at Bizzy Becs for our Anything Goes Challenge this month.